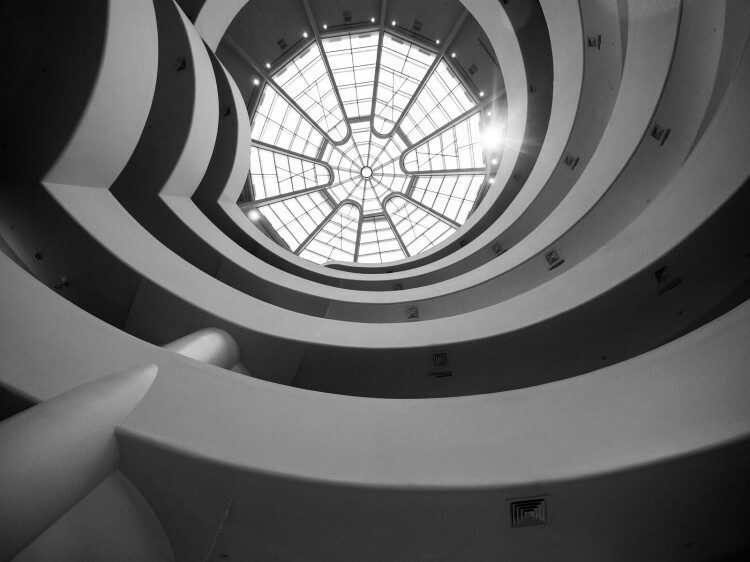 This image shows the interior of the Guggenheim Museum in New York City. Designed by Frank Lloyd Wright and built in 1959, the museum is unique in its use of a spiral ramp to lead patrons through the exhibited items. To view an exhibit you take an elevator to the top and walk down the ramp. 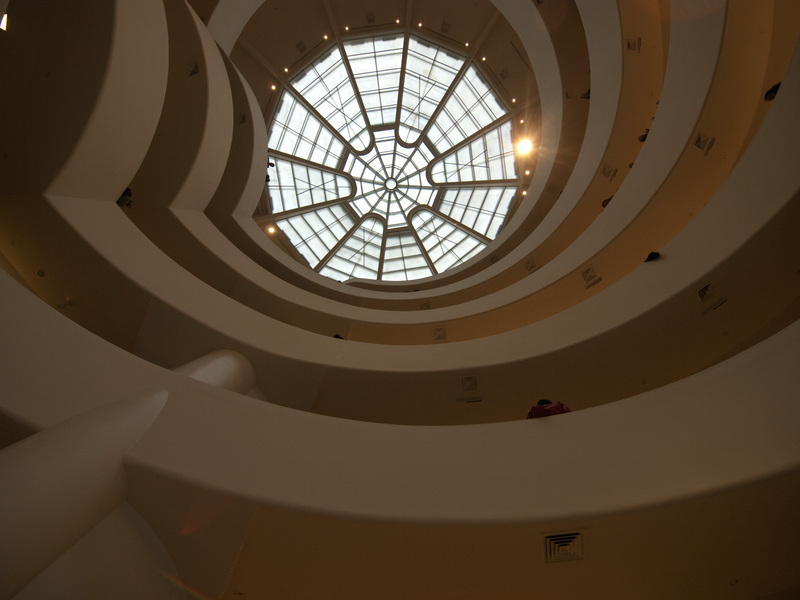 It’s an interesting museum and I highly recommend a visit if you are in New York City. I took this shot in 2009 and it’s been sitting in my Lightroom catalog in various states of editing. I think the design of the space works well with a high contrast black and white, but I was bothered by various ‘blobs’ hanging over the edge of the railings. I wanted to have the edge of the ramp be smooth without distractions of people, coats, etc. breaking up the line. I’ve tried various times to get rid of these extras but I was never able to get a smooth clone. The color/texture/angle just didn’t match up and you could always see the work. I tried again a couple of days ago using a slightly different technique and was pleased with the outcome. The technique involved using a combination of Content Aware Fill in CS6 and the Clone Stamp Tool. I would initially select an area to replace and use the fill. Sometimes the result was perfect and I just left it, other times it created a slightly blobby line that I needed to correct. The nice thing about the Content Aware Fill is that it blended the texture and color so that it was hard to see where the edit was applied. I then used a clone layer to replace the blob section of line (basically the edge of the ramp railing) with a straight section. Sometimes I had to use a mask to limit the change to just the railing edge to avoid texture/color issues. The one challenge with using the clone stamp was dealing with the angle of the ramp. In most places, if I used a straight clone, the angle of the railing didn’t match. I had to go into the Clone Stamp settings and adjust the angle of the clone to match the angle of the ramp. This was a technique that I didn’t used to know how to do and it made a huge difference. The shot below is the ‘as shot’ image. If you look at the ramp you will see various places where people or things are hanging over the edge. If you look at the finished image, the items are gone. Makes for a much better image in my opinion. All images available for sale or license. Please visit my Imagekind Galleries or contact me for more information. Wonderful shot James. I really like the B&W version as it brings out all the graphic elements beautifully. I recognise that view! I like your take on the scene and applaud your cloning. I only had to remove one person from my shot (posted last week, I think) and it was a small enough section that a simple clone did the job. I wonder if different exhibits operate differently. We were there for the Kandinsky exhibit and they told us to go to the top and walk down as his older works were up top and progressed as we walked down the ramp. Wonderful shot, James. I like both versions. The B&W brings out some nice detail and color has a certain warmth. I see what you mean about the things exceeding the edge of the ramp, but I don’t feel that they detract from the overall image so much. Thanks for the comment! My preference with architectural shots is to not include people unless they help create a sense of scale. This shot wasn’t too bad but working with the larger image it bothered me and besides, it was a good chance to improve on my Photoshop skills! Very nice composition, James. I especially like the B&W version and applaud your work on cleaning the blobs from the ramp. Although the blobs do add a sense of scale, I personally think they did distract from the overall image. I also like what you did with the sun burst – it adds a nice finishing touch. Great image and very nice “cleanup” with Content Aware Fill in CS6 and the Clone Stamp Tool. I like your composition very much. I’ve started using those tools and am amazed at what we can do with the technology. It’s not like the early days of PS. First, you have to start with a great image. And this one is! I was just there myself, got some nice ones, but I really like this perspective. Great processing as always. Sweet shot love all the lines and the way you framed it all up. Once again, B&W works very well here. In fact the color does not work at all for me this time. You sure do get around! !